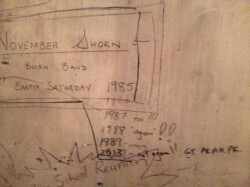 November Shorn Bush Bands first ever performance took place at Canowindra in 1981. The name, November Shorn stems from their first performance being in November of that year and the Irish boys name Shaun, as much of their music originated from Ireland. The word shorn also came into play as many of their songs were also about sheep. However, as people became accustomed to the latter spelling when referring to the band, it was decided it would be used instead. 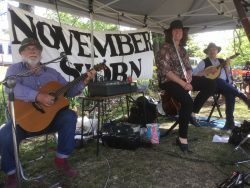 The original seven members had, within a few months, became five and it was this group that began to lay the solid foundations for the November Shorn reputation as a good fun dance band throughout the Central West of NSW. By the mid 1980’s, five had become four as the word continued to spread between Sydney and Bourke. By 1990 the band had become a trio when Ross Gilbert joined the two remaining original members, Paul Kelly and Geoff Tonkin. 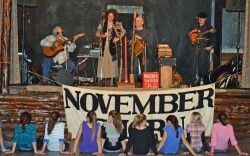 It was this line-up that recorded the CD Live at Nashdale in 2003 to celebrate the bands 21st year. Geoff Tonkin said, All past and present band members have only ever been amateurs but the bicentenary year 1988 was definitely our busiest. We played 72 gigs that year and still took no work on one weekend every month. The band continues to be in high demand throughout Central West NSW. 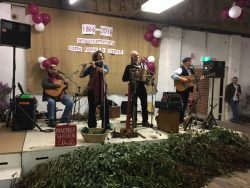 Mr Tonkin said, We guess-timate we have done over 600 gigs in country hall, school halls, shearing shed, haysheds, packing sheds, backs of trucks, verandahs, gardens, marquees, clubs, pubs etc. etc. from Bathurst to Bourke and Armidale to Gundagai in those 30 years. We cover such functions as weddings ( probably 20% of our work) birthday parties (18th to 90th), town centenaries, school centenaries, bicentenary celebrations, Year of Outback, Year of Federation, Haley’s Comet and Year 2000 plus many more. For me one of the enjoyments has been seeing the looks on children’s faces as they dance around the floor with Mum or Dad or Grandma or Grandpa because the lively music has a very infectious quality about it which pleases everyone and children, these days don’t get much opportunity to dance with their parents or grandparents. Paul Kelly on Vocals, Mandolin, Tenor Banjo, Guitar, Bodhran and Spoons. Geoff Tonkin on Vocals, Accordions, Harmonica, Whistle, Didgeridoo, Lagerphone and Dance Calling. Ross Gilbert on Vocals, Guitar, Harmonicas, Slide Guitar, Mandolin and Beat Box. .For booking, please call Geoff on (02) 63668174 or 0427 677 226. Paul Kelly can also be contacted for bookings. Gooloogong Log Cabin Hall May 2014 and back stage evidence as to the number of times November Shorn has played at Gooloogong.